In 2005, author and illustrator William Joyce teamed with Reel FX to form Aimesworth Amusements, dedicated to creating computer animated movies. For their first feature, Joyce looked back to many years ago when his daughter, Mary Katherine, asked him if Santa Claus knew the Tooth Fairy. From that simple question, Joyce developed the idea for The Guardians of Childhood, in which the most famous fantastical characters team to protect the innocence of early childhood. While Aimesworth would never make the feature, Joyce went on to direct the animated short The Man in the Moon, which served as an introduction to the Guardians. Joyce sold the Guardians film rights to DreamWorks Animation in 2008, after the studio promised to keep his vision and involvement with the picture. Joyce was excited at the thought of his passion project finally reaching theaters. Then tragedy struck: Mary Katherine suffered an untimely death from a brain tumor, at just 18 years old. A heartbroken Joyce stepped down as director of Guardians. He would continue to guide the project as an executive producer, dedicating the film to the memory of his daughter. 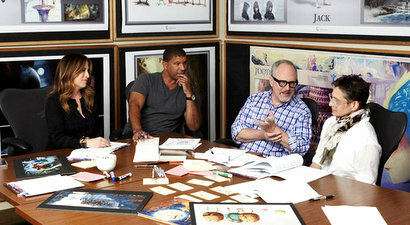 Later that year, DreamWorks hired veteran storyboard artist Peter Ramsey to helm Guardians, as he had recently completed his directorial debut with the TV special Monsters vs. Aliens: Mutant Pumpkins from Outer Space. Guillermo del Toro joined DreamWorks in 2010, as a producer and story consultant for the studio’s slate of films. Intrigued by Guardians, del Toro made the film one of his top priorities. Meanwhile, Joyce authored a series of Guardians books, to build anticipation for the DreamWorks feature. 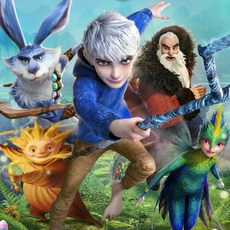 Rise of the Guardians finally hit theaters nationwide on November 21 last year. The film opened with $32.3 million over the extended five-day Thanksgiving weekend, placing fourth behind The Twilight Saga: Breaking Dawn – Part 2, Skyfall and Lincoln. Fortunately, positive buzz contributed to Guardians showing strong legs at the box office: in its third week of release, the film rose to second place, keeping that spot for two weeks. Ultimately, Guardians collected $303.1 million worldwide. Now audiences can experience Guardians at home, with the film available to own via Blu-ray, DVD and Digital Download. 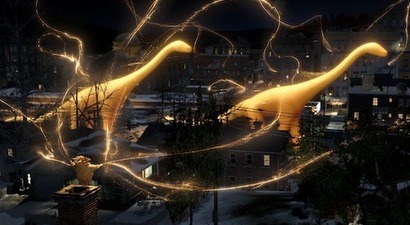 To celebrate the release, director Peter Ramsey talks with Animated Views about making the film. He also shares his thoughts on being the first African-American to direct a big-budget computer animated feature, as well as Guardians‘ performance at the box office and whether a sequel could still happen. 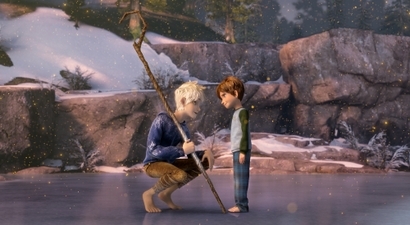 Animated Views: Rise of the Guardians is about childhood. When you were a child, did you ever think that you would someday make an animated feature? 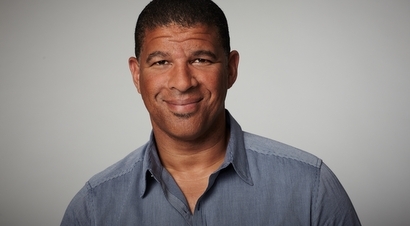 Peter Ramsey: As a child, I don’t know if I knew what a director did in animated features or any feature, for that matter. But it always entranced me. I always wanted to be part of the process of doing it somehow. I just didn’t know how. It took a lot of years to figure that out. AV: I’ve read that although you didn’t get to see a lot of movies, you remember one time when your parents took you to see Snow White. PR: Yeah, it was incredible! The whole thing was special. I don’t know if you’ve ever been to a drive-in theater, with your mom and dad at least. I was four, in my pajamas, in our car, and I was out at night, which was a big deal in itself. And then you see this gigantic screen with this incredible movie on it. I probably fell asleep before it was over. But it was a magical thing; it really made an impact. AV: How did you get started in the entertainment industry? PR: I didn’t have any family connections or anything like that, despite having grown up in L.A. But I was working, and I had gotten bitten by the film bug. I was really interested in the idea of filmmaking and directing, but I had no clue how to actually work in the industry. It wasn’t until some friends of mine started working in little fringe positions on really low-budget features; one friend became an assistant to an art director. That started opening my eyes to the possibilities. I did a few little, low-level art department jobs and a couple of tiny-budget features, and I found out about the craft of storyboarding. It was one of those weird things: I had seen storyboards before, and I knew what they were, but I had never put two and two together as it being a possible way for me to work in the industry. So, I ended up signing with this agency that repped storyboard artists for commercials, and they had just started to break into repping people for film. I did commercials with them for a year, and then I got me a movie! I storyboarded a movie – but it never got made. It was for a guy named Frank LaLoggia, who did a really good movie called The Lady in White. Although his movie I worked on never got made, it gave me a portfolio. From there, I got other work, and it snowballed. I got into the Union, and I got to work on a lot of big-budget Hollywood films. AV: Wasn’t Shark Tale your first feature for DreamWorks? PR: Actually, I came to DreamWorks for Shrek the Third. With Shark Tale, I remember they had some story problems they were trying to crack, so they got a bunch of us story artists from Shrek to come and toss around some ideas and sit on a few sequences. My time on Shark Tale was just coming up with a few gags. I don’t even know if anything was used. I just storyboarded with some other guys for a week, and then that was pretty much it. So, really, Shrek the Third was the beginning of my time with DreamWorks. 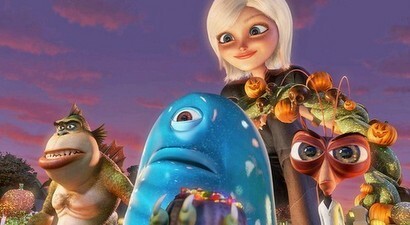 AV: What was the timeline of when you started at DreamWorks to when you were selected to direct Rise of the Guardians? PR: I started at DreamWorks in the spring of ’04. I worked on Shrek the Third for about a year and a half. After that, I spent a little time working on early development for the Puss in Boots feature. Then I was the head of story on Monsters vs. Aliens; by this time, it was – I guess – 2007. After finishing that, I directed a little half-hour TV special based on Monsters vs. Aliens, and that took me up to the summer of ’09. The possibility of Guardians came up in the fall of ’09, not long after finishing that TV special. So, that’s kind of the road it took. Then it was three years to finish Guardians, which brings us up to now. 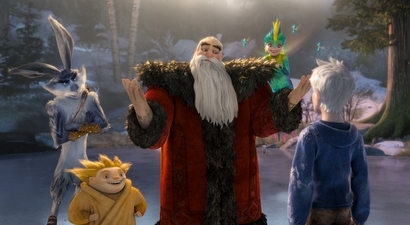 AV: With Rise of the Guardians, you’re the first African-American director of a big-budget computer animated film. Could you describe how that feels? Did it add pressure? PR: Well, you want to do a good job. Once people start saying that, you’re like, “I’d better not screw up!” But it’s not something I ever really thought about. I think, when I first got it, I thought, “Wow, am I the first? Maybe so…” And then I was just like, “We’ve got to get down to work,” because I’ve never been made to feel like I was any different; it’s just never been a consideration at the studio, for sure, or among anyone I’ve worked with. But I’m glad it inspires people I talk to. I go to schools and youth groups and talk to them, and it means a lot that way. That’s what has real significance about it. AV: There’s a great story about your dad’s reaction, when he read you were going to direct the film. Do you remember the story I’m talking about? But he read that. I looked at him, and he had tears in his eyes. He’s from a totally different generation; he was born right around the time of the Depression. There was still segregation in the South, when he was growing up. He’s seen a lot. And to have even a tiny piece of history like this – if I could call it that – it really struck me how significant it was to a lot of people. I started taking it a little more seriously after that. 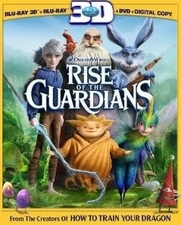 AV: Can you give an idea of the history behind Rise of the Guardians? They came up with the idea that Bill would write this series of books; he would develop these characters individually, telling their histories one by one. 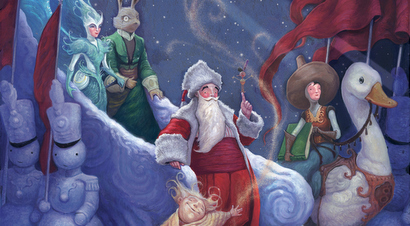 How Santa Claus became Santa Claus, what’s the deal behind the Tooth Fairy, etc. Then we would start developing at the studio, on a parallel track, a movie about the first time we ever see them all working together as a team, ala The Avengers. So, both of those things were happening at the same time. 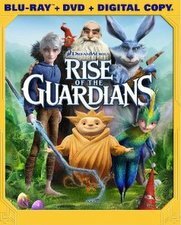 When Bill’s books started coming out, there was already early thought on what the movie, which became Rise of the Guardians, would be about. AV: So, the movie is kind of a sequel to the books, in a way. PR: In a way, yeah! The books, if you’ve ever seen them, have beautiful illustrations, and the stories are really detailed and wild. You could never imagine the variations of the legends that Bill comes up with. But they take place hundreds of years ago; our movie takes place, more or less, in the present day – way, way, way after the events in any of the books. AV: At the beginning of the film’s production, Joyce was going to be a co-director before his daughter’s untimely passing. May I ask what went through your mind during that time? How did it affect your mindset toward the project? PR: By the time I came on in ’09, the prospect of him co-directing was actually a thing of the past. His attachment was kind of lingering around in the news, though, because things take a long time to correct once they get out in the media. But when I came on, I was always the sole director. It was never an issue for me. I spent quite a bit of time with Bill, and we talked a lot. We worked together quite a bit, sharing ideas. We’d pitch sequences, artwork and designs to him all the time, to get his feedback. But our relationship was never one where he felt like I was taking anything over, or I felt like I was stepping on his toes as a filmmaker. It was always us working together once we got to know each other. And yeah, the situation with his daughter, it’s just so ironic. I wanted to preserve what felt like the truest and the most important aspects of his original concept; I think that’s what that whole situation did for me. His idea came out of something really sincere and touching. I wanted to preserve that. AV: Joyce has said the idea for Guardians came from Mary Katherine. The way he always put it was, we know all these details and all this mythology about Batman, Superman, Star Trek, and other fictional characters. But the ones who were most important to us when we were children, we really don’t know that much about, so it might be fun to come up with an alternate history for what they’re really like. AV: At what point did Guillermo del Toro join Guardians? PR: I had been on it for probably about a year. We were moving forward, when Guillermo struck up a relationship with the studio. Overall, it was the kind of relationship where he was going to advise and consult on a lot of projects, and maybe executive produce a couple if he felt really passionate about them. So, Guillermo was making the rounds, and everyone was pitching their projects to him, so he could see what was going on at the studio. We gave him our Guardians pitch; we pitched him a few sequences and the basic story. We showed him a ton of artwork we had created. He fell in love with it, because it’s kind of right up his alley. It’s got all these mythic things; it’s very visual. It’s got different worlds; it’s got magic. It’s got children. It’s got an edge of darkness to it. All these things about it, he really went wild for and liked where we were going. He wanted to make sure we could safeguard some of the things that we felt passionately about, so that they didn’t get chewed up in the process of making a movie at a big studio. So, he came on as an official executive producer. We did a lot of reshaping of the story, which we were redoing anyway, with Guillermo’s input. He’s such a great storyteller and has such a feel for this kind of material that he was a fantastic asset. He would weigh in on a lot of things; he’d give editing notes and design things. But he was always pretty forthright on wanting to support us, and me making the movie I wanted to make. AV: The movie has a great cast: Jude Law as Pitch Black, Alec Baldwin as North… But how did you cast the film? I mean, how were you able to hear Baldwin and think, “That’s the guy to voice a Russian Santa Claus”? But I thought about it, and the idea struck me: “You know, what if we tried him as North?” Because the thing about North, our version of Santa Claus, is that he literally is naughty and nice. He is this warrior, this wild man, this Hell’s Angels kind of guy. But the other side of him is that he has a really childlike, impish, mischievous sense of humor and a heart of gold. He’s a real softie inside, which is what motivates him to use all this fierce energy and passion on behalf of kids. So, thinking about it in that way, Alec Baldwin actually seemed perfect. When we got him into the recordings, his ad libs and the way he interpreted the character made us really, really happy. I just wish we had more time in the movie to explore North even further. I think Alec nailed that aspect of the character so well and fulfilled my hopes so completely that it would have been great to give him way more room to run. 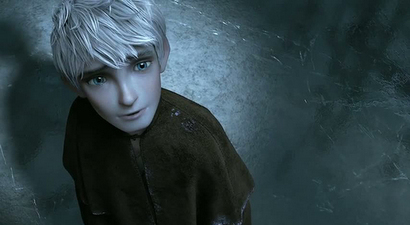 AV: Wasn’t Leonardo DiCaprio originally going to voice Jack Frost? PR: Once upon a time, but that was before I came on. I think he had talked with them a bit. I don’t know how serious it ever really got. But the rumor got out there. I never worked with him though. By the time I was there, he was clearly not really a possibility. It was fine, because once we seriously started thinking about casting and the idea of Chris Pine came up, none of us could get Chris out of our heads. The idea of Chris’ voice was a little jarring to us at first. We saw him in a play here in L.A. at the Mark Taper Forum, and he was electrifying in the play. When we put his voice against the animation, it felt so right. It just made Jack feel so timeless that it was like, “This is our guy.” And the way his voice fit in with the rest of the ensemble, too, was a real plus. AV: I want to ask about a popular fan theory on Jack. I’ll have to add a spoiler alert for this question. Jack and the little boy Jamie seem to have a special connection. Is Jamie a descendant of Jack’s sister? PR: Who knows…! It could be possible… One of my regrets is that we didn’t have more screen time in the movie to flesh things out a bit more. Is there a bigger connection between Jamie and Jack? Yeah, that could be a definite possibility, that there’s some kind of lineage connection like that. It’s one of those movie mysteries. AV: Guardians got great reviews; it also had strong legs at the box office. But the week after it opened, analysts were already saying the movie underperformed. What went through your mind? Were you thinking, “Hold on, guys! Let’s see how it does while it’s still in theaters!”? Yeah, it was a real eye-opener. It was my first experience opening a major motion picture. You just have to strap in, because it is a real roller-coaster ride. I think we made over $300 million worldwide. What can I say, it’s a bizarre world where that can be considered a disappointment. But given the financial realities of corporate movie-making these days, it’s a whole different kind of mathematics. So, yeah, it was really shocking, realizing how much the picture has changed for animated features in the marketplace now. I think we went in feeling like we didn’t have too much competition when we were opening. What wasn’t fully accounted for was that Skyfall and Twilight were our real competition. I mean, it’s not a world anymore where an animated feature, just by virtue of being an animated feature, has a guaranteed ride. It was a very crowded marketplace for us. I think the awareness for the movie, strangely, just wasn’t there as much as we were hoping it would be. It’s been a real bizarre experience. But I have to temperate it with the fact that so many people, whether it’s after screenings or just by pure chance or fan mail, have told me how much they love the movie. It really did connect with the people who saw it. AV: Will we see more of the Guardians, either on the big screen or the small screen? PR: I’m not the person to ask about that one! [laughs] I really wish. It would be a wonderful thing. I don’t know. Given the way things have shaken out, it’s tough to see now. But hey, you never know. If enough people want it, I’m sure there’s a way it could happen. There are more stories to tell. It would be amazing. AV: What’s next for you? PR: Some rest and relaxation. Things have quieted down now. I’m sort of taking stock and reading things. There are a few things I’m looking at, but I haven’t really settled on anything yet. But I’m still hanging at DreamWorks for a bit. AV: As someone with an inspirational story, what words of advice do you have for one of our readers who wants to work in animation someday? PR: I’d give the same advice given to me: Don’t give up. You just keep pushing forward with whatever tools you have. I never was an excellent animator, but I always drew, and I was always telling stories. So, for me, it was all about learning the craft of filmmaking. Read and devour as many movies as you can, or make your own movies. There are a lot of great schools where you can study animation and make great animated films. Do anything that actually allows you to work on your craft. As long as you keep doing that and letting people know what you want to do, doors will open. The key is never quitting. Our sincerest thanks to Peter Ramsey, and to David Hail at DreamWorks Animation.